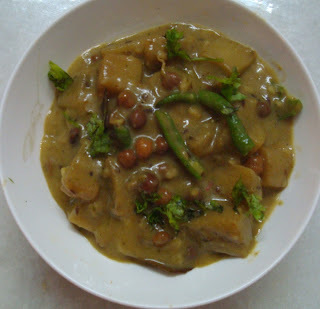 Foodmantra: Have You Tried a the Unique Curry made out of Banana Bark? Have You Tried a the Unique Curry made out of Banana Bark? I am preparing the banana stem. It tastes similar to a bottle gourd; the texture is somewhat crispy and way more fibrous than the bottle gourd. I was very excited about preparing and trying out this curry. Just the day before, Mrs. Basu my mother’s friend had taught me the recipe and the intricacies of cleaning and preparing the banana stem recipe. Fortunately, the following day, our ten foot banana tree had to be cut down. The fruit was too heavy for the tree but I was ready to rescue the stem and add it to my delicious Bengali curry. The Banana flower and the banana stem are both delicacies in Bengali culture. If you are new to these ingredients and recipes, like me, it may take a little time to adapt to the flavours and textures of this recipe. I must warn you it is not an easy job to get to that flavourful banana stem. Layers of the bark are peeled and right at the core is an off white, spine of the tree which is used in this curry. The Banana Stem or flower, whichever you choose, is first chopped and dipped in water with salt and a pinch of turmeric. For the banana stem, once it is chopped and dipped in the salt and turmeric water, it releases thread like fibres from its surface. These fibres must be removed before cooking the stem. Cut the banana bark and dip it in salt and turmeric water for thirty minutes. Remove the fibres of the banana bark with your hands. Steam the banana bark in steaming vessel or on a strainer placed over boiling water. Allow it to cook for fifteen to twenty minutes, until it is half done. Set Aside. Make a smooth paste with Coriander, green chilli, Cumin and ginger. Marinate the banana bark along with the soaked Bengal gram in the mixture for an hour. Heat clarified butter in a pan. Add in the whole spices, cardamom, cloves, cinnamon, bay leaf. Once the whole spices turn a shade darker, add in the marinated banana stem and the Bengal gram to the pan. Cook for fifteen minutes on medium heat. Stir. Put the lid on and cook for fifteen minutes on a low flame. Sprinkle a few drops of water if necessary. Mix the flour and milk together in a bowl. Add this mixture in the curry and stir it in. Allow the curry to cook for five minutes on low heat, until the flour in the curry is cooked completely. Note: There is a lot of iron in the banana bark. It goes black if it is not dipped in turmeric water immediately.